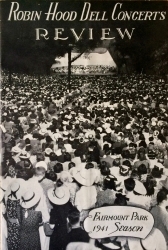 At the time of the concert this increasingly RARE program documents—the Fairmont Park concert on July 10, 1941—Benny Goodman was the at the top of his game. He was hailed the King of Swing, and he had revolutionized Jazz in a series of triumphs during the previous decade. The great Charlie Christian had just left the band, but the Benny Goodman sextet did perform as well as the Goodman Orchestra in a symphonic setting. The program lists the orchestra personnel including famous classical names. The program is an essential for Goodman and Swing Era collectors, a rare bird that documents Jazz's prime time in American pop music!